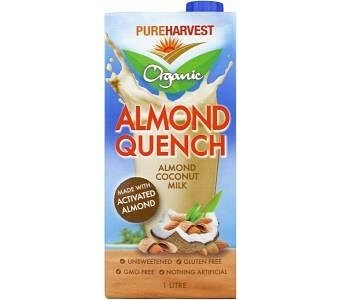 Coco Quench is a full flavoured non-dairy milk made from a blend of organic almonds and organic coconuts. Our 100% natural recipe combines the full health benefits of organic coconut, almonds and brown rice. The healthy fats of the coconut and almonds are matched with the sweetness and complex carbohydrates of the rice to produce a delicious balanced beverage. Full of flavour, nutrients and bursting with health benefits this coconut based drink is a delicious addition to any diet. Completely free of all nasties. Ingredients: Filtered water, organic coconut milk 5%, organic activated almonds 5%, organic brown rice, and small amount of rice malt syrup and sea salt.